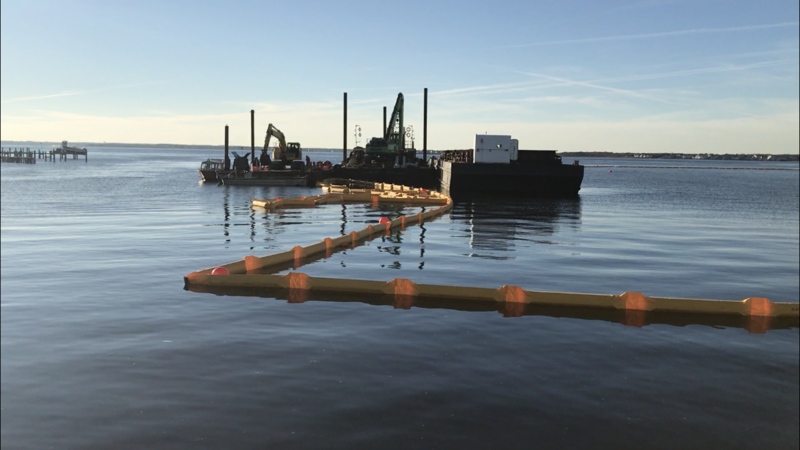 Marine construction crews began work over the last several days on one of several dredging projects that will keep several channels in northern Barnegat Bay open to boat traffic. Most visible is the large barge that anchored up just off Bayside Park, along Route 35 south in Brick Township’s Normandy Beach neighborhood over the past several days. There, the contractor for the state Department of Environmental Protection will transport and place about 180,000 cubic yards of sediment in several “dredge holes” off the park. Boats could be seen transporting sediment to the area through the weekend and will keep doing so through the end of the year. A containment boom has been set up around the project site so silt and sediment will not escape the immediate area. Crews will work in 12 hour shifts. Several areas are included in the project – specifically, the channel to and from Green Cove Marina in the Metedeconk River (the first leg of the project), the Upper Metedeconk Channel (which leads toward the marinas along Route 70), the Beaver Dam Creek north and south channels, the entrance channel to Winter Yacht Basin, Sailor’s Quay and the Kettle Creek channel. 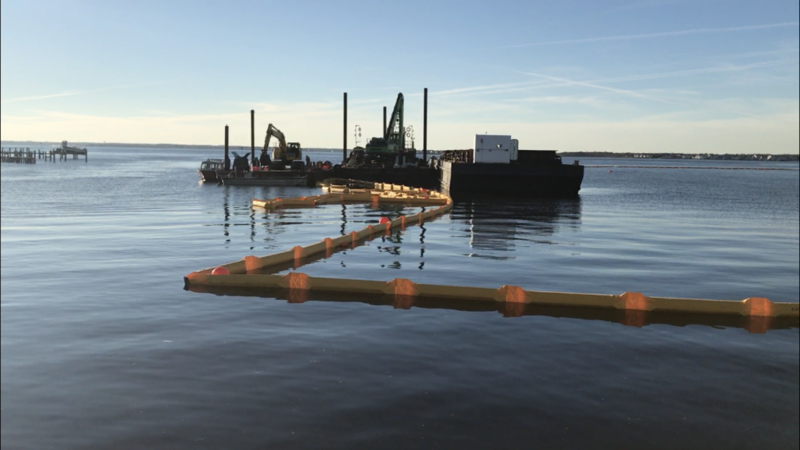 Additional dredging will be performed in the Bay Head Channel. The project is part of a larger, $16 million state initiative that was awarded earlier this year to H&L Contracting of Bay Shore, N.Y. The project has created some concern in the Normandy Beach neighborhood, however state officials say the work will actually improve the bay bottom in the area where the dredge holes are located. After the sediment is deposited there, the contractor will cap the holes with fresh sand and that can support additional submerged aquatic vegetation which fosters marine life such as crabs and juvenile fish. The project is not a part of the expected dredging of Lavallette Channel.